More than 200 people attended the third annual capstone gala, Wishing Upon A Star, at the Hampton Inn & Suites in Cazenovia. The venue hosted a sold-out event, as people came to support the students and raise money for the Make-A-Wish Foundation of CNY. 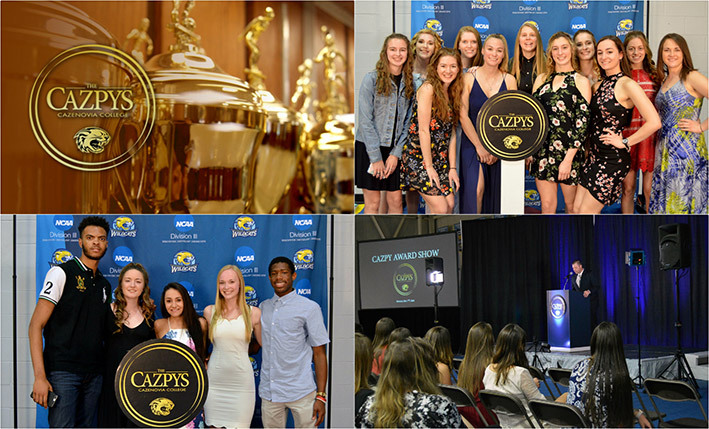 Wildcat student-athletes, coaches, and supporters of Cazenovia College Athletics gathered to celebrate athletic achievement, as well as academic honors, at the 3rd annual CAZPY Award Show. Meet Jeremy Bombard, Fashion Merchandising major from Canastota, New York, and learn how Cazenovia College has provided him hands-on learning by being involved with the Annual Student Fashion Show. Meet Emily Boni, Fashion Design major from Bellingham, Massachusetts, and learn how Cazenovia College provided her the opportunity to study her passion, gaining hands-on experience through displaying her designs on the runway and an internship experience in NYC. Lori Lewis is the director of Common Grounds, a community space in the village of Cazenovia. Lewis facilitates the use of Common Grounds, located at 35 Albany Street. The space consists of a common area on the first floor and two conference rooms on the second floor. SPAC is one of the political and advocacy clubs at Cazenovia College. SPAC's mission is to provide a safe and open environment for those who are part of the LGBTQ+ community, along with those who identify as an ally. Students in Cazenovia College’s fashion design and fashion merchandising programs presented the 45th annual student-run fashion show on Saturday, April 21, at at the Landmark Theatre in Syracuse. Cazenovia College hosted the 'Seize the Power: Cazenovia Renewable Energy Fair' on Saturday, April 14. The fair brought together local residents, students, business owners, farmers, and industry experts for a hands-on afternoon of fun and learning about renewable energy.